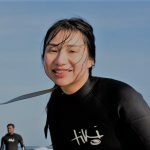 As part of developing our SurfABLE and SwimABLE projects, we’re delighted to be working with Xiang Li (some have already met), from The Glasgow School of Art, Design Innovation. It would great for Xiang (and especially us), for those have taken part in these projects, to spare a moment and answer just a few questions which will help us a lot. Especially future funding! The questions may seem a little obscure, however it will make sense in research and measuring our impact. All information given is anonymous and it takes only a short time to complete, and you’ll be helping us greatly. Thanks folks. Please read the following questions and tell me your happiness before your child or person in your care joined the surfing session and after your child join the surfing session by sliding the slider towards the right, 0 means disagree and 10 means agree. In finding the right course for your child/person in your care, do you think it saves you money to some extent?